Countertop fabrication is an industry of beauty and precision. When a customer has a countertop installed, they have every right to expect a flawless finish and modern elegance. What they shouldn’t ever expect it a Countertop fabrication is an industry of beauty and precision. When a customer has a countertop installed, they have every right to expect a flawless finish and modern elegance. What they shouldn’t ever expect it a crack in their countertop. A crack can be a shocking and disappointing find for a homeowner. Today, we’re going to talk about a break in the countertop and the value of getting it repaired as soon as possible. First, we need to examine the difference between a crack and a fissure in granite stone. A fissure is a naturally occurring variation in the stone which is part of the pattern of the rock itself. These can be naturally occurring disparities in color. A crack is neither naturally occurring or the result of pattern variations, although sometimes a break can be caused at the line of a fissure. These are almost always the result of poor fabrication, handling, or installing. When dealing with natural stone, there is always the possibility for a crack, because stone countertops or heavy and bulky and there are some installation requirements which are specific to the avoidance of cracks following installation. But, a good installer will never leave you with a cracked countertop, or a countertop which has been broken and then obviously repaired. Once your countertop is installed, it’s always possible that a crack or break can form down the road. For example, if someone stands on the countertop, or a mishap during the installation of a large appliance. While it rarely happens, the most critical thing the homeowner can do is contact the countertop installer immediately. If it’s a chip or break, save every piece, no matter how small, and contact the counter installation company to repair it. Some homeowners feel confident in their ability to fix it themselves, but others think the counter has enough value to warrant having an expert fabricator conduct the repair so it will be as unnoticeable as possible. 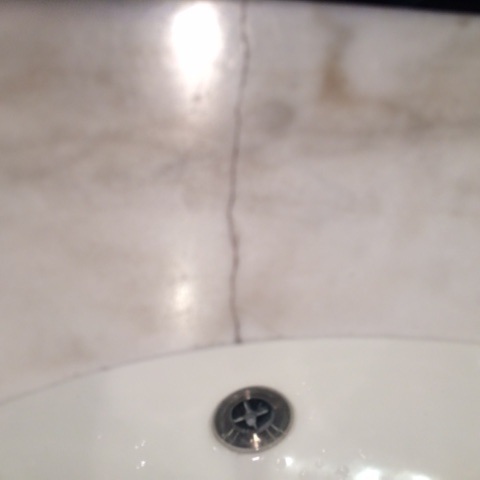 The essential thing to remember is that if a countertop does crack, it’s well worth the money to have it repaired. In doing so, a homeowner is protecting their safety by not permitting bacteria to get a grip in the crack, and preserving their investment by keeping their home in the best condition possible.